When did your great grandparents get married? Which one of your uncles was born first? Once you and your family have put the information into Geni, you can then access that data very easily with the Family Timeline. If you’re only interested in certain parts of your timeline, you’re in luck. It’s very customizable. 1. You can change the date range (ex. 1908-2004) with the slider in the red box. 2. You can change which people appear in your timeline (ex. You, Your Ancestors) with the checkboxes in the green box. 3. You can change the kind of events that will display (ex. 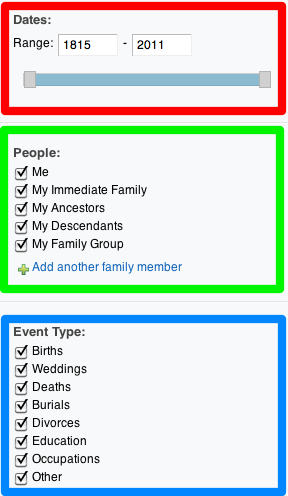 Births, Marriages) with the checkboxes in the blue box. It’s as simple as that. 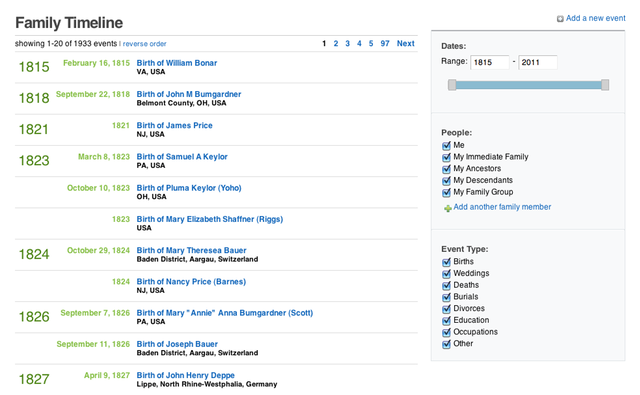 Whenever you need to sift through your family’s history, the Timeline is the place to go.